You may have heard of prong settings, channel settings, or even bezel settings, but have you ever heard of burnish settings? Clean and contemporary, a burnish setting offers a unique, recessed perspective on diamonds. Our 14k white gold diamond eternity ring for men burnish-set is the perfect solution for modern couples looking for the heritage associated with gold but the look of platinum. Affordable and malleable, white gold provides a wealth of possibilities. You can accentuate all six burnish-set diamonds with a cool, white hue while enhancing your everyday look with the handsome satin finish and a high-polished cut. Discover the radiance to be had in our 6mm 14k white gold diamond eternity ring for men burnish-set today! Stylish men are demanding diamonds, and this designer trend has taken over men’s wedding bands. 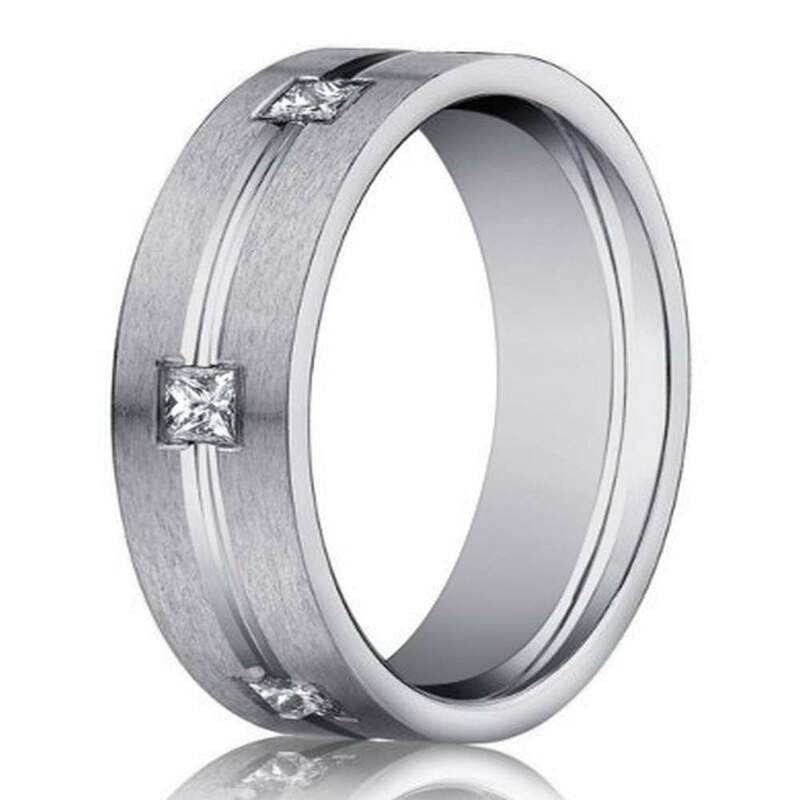 Our 14k white gold diamond eternity ring for men burnish-set is an easy choice to symbolize your love, passion, and the endurance of your commitment. The princess-cut diamonds are a unique alternative to traditionally round-cut diamonds. With a total carat weight of 0.6, this ring adds just enough sparkle without overpowering your groom’s ruggedly sophisticated sense of style. We designed this ring with a comfort-fit band, so men who live very active lifestyles or work with their hands each day need not worry about straining their ring over their knuckles. Make your wedding day and each day thereafter a tad more special by adding a custom engraving! Enjoy the sheer elegance of our 6mm 14k white gold diamond eternity ring for men burnish-set, and we guarantee you will fall in love again and again.